Let’s talk big picture and scary stats right off the bat, shall we? According to a recent survey, 69% of Americans have less than $1,000 in savings. Just let it sink in for a minute: seven out of ten people’s savings will be completely wiped out with the next illness or a minor car problem. Terrifying? Absolutely. Yet the scarier thing is not the fact that all these people are living behind the poverty line or don’t have an extra cent to put away; the primary reason for this unsettling statistic is the fact that many of us live beyond our means. Let me explain the difference. As a second generation immigrant, I grew up what most would consider “poor” – we had enough money to put food on the table daily, but McDonald’s trips were a luxury and a treat. From necessity stems creativity – I’ve learned to be thrifty, to reuse and recycle. Yet there is a huge difference between wearing second-hand clothes because there is no money in your bank account to buy new ones and not having money in your bank account because you spent your last dollar on brand new clothes when your closet is bursting at the seams. All financial freedom needs to start with defense. Saving money is not taught in school, so consider it your Money 101: just because you can pay for something, doesn’t mean you can afford it. Many of us are so concerned with treating our present selves, we rob our future selves to do so. You’ve heard it before – pay yourself first, always! Put 1% of your paycheck into a bank account you specifically make for long-term savings. After a month increase the amount to 2%. After the second month increase it to 3%. Work up to 10%. I didn’t say it would be easy, did I? And we are creatures of habits and change is tough; I understand it like no other. However, stick with me on this one for a few months, watch your account balance grow, and you might not ever want to go back. Feel like you’ve mastered the art of defense against money-draining tactics? Let’s graduate to a more advanced class – Money Offense. The difference between middle class and 1% is not just the amount of money they have in their bank accounts – it’s the fundamental difference in how they approach it. The poor play the money game not to lose. The rich play it to win. How do you play to win? Don’t spend “old money,” make new. Approach any small business owner you personally know and tell them you will help them. Small business owners always need help. clean out your house and have a garage sale. Let go of the idea that you have to earn a minimum of $X/hr; our inflated self-worth often prevents us from realizing our financial freedom. The market will pay more as you provide more value. Complaining doesn’t solve your issues but creative thinking might. Finally, here’s your disclaimer: these are not “quick fixes” (although they might get you out of a temporary bind); in order to quit the rat race you need to adopt these philosophies as part of your lifestyle. 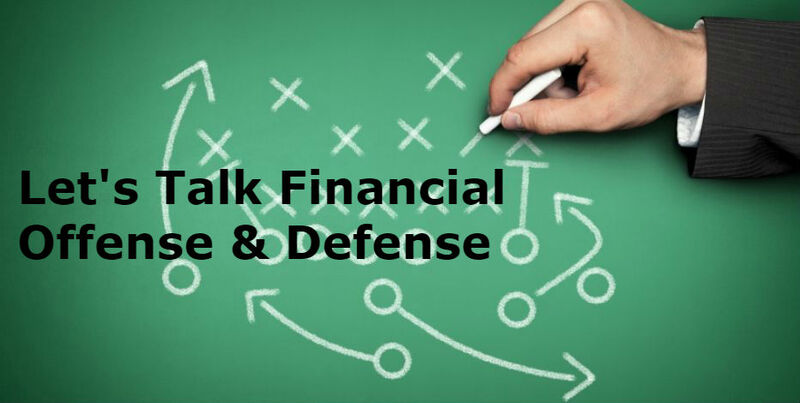 Start with defense, ramp up your offense game and watch the money issues dissolve over time. Which side do you want to play on? Are you on your way to financial freedom? Share the steps you are taking as well as any ideas to play better in comments below.